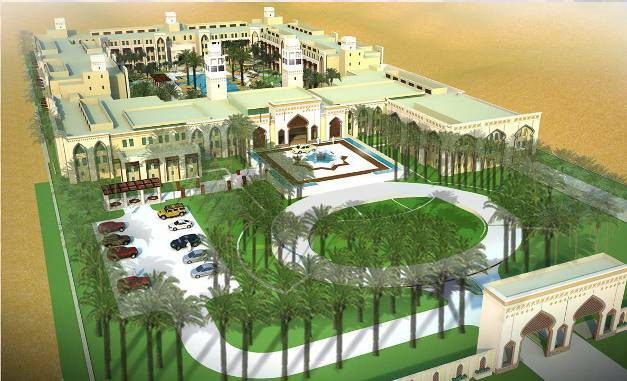 Conceptual design for a five-star hotel in Baghdad, Iraq was developed using precast concrete module construction method. The precast concrete modules were considered for the project due to their short construction time and security. MEP (Mechanical, Electrical and Plumbing) systems were installed prior to shipping from the port at Jacksonville, Florida to Iraq via Jordan. The module construction is normally used in the USA for penitentiary construction. Module modification was needed for hotel construction since the hotel room must be much more spacious and luxurious than the jail cell. However, the constraints from manufacturing process and transportation such as maximum weight and dimension had to be considered. 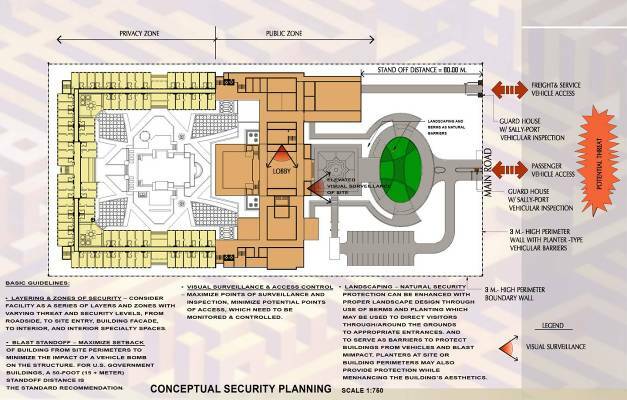 The planned location for the hotel was the 5.40-acre (22,048 m2) land plot in the Green Zone near the US embassy. 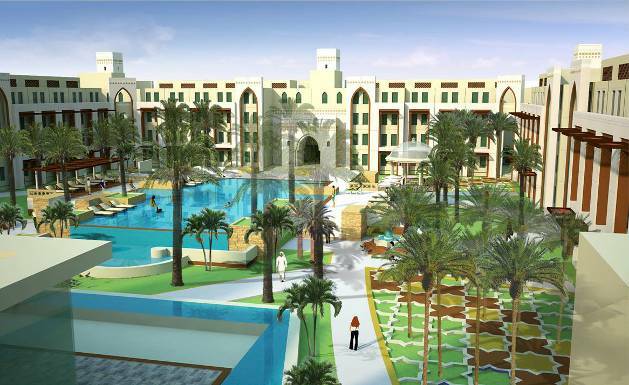 The plot dimension was 212 m by 104 m. Because of the risk in Iraq at the time of the conceptual design, the hotel layout had to take into account of security of the hotel guests in addition to the common requirements. The precast concrete module construction could meet the security criterion easily due to their reinforced concrete walls. The hotel layout was done in such a way that the hotel guestrooms were farthest removed from the main street, which could possibly contain threats. The public area was adjacent to the residential area, shielding it as another precaution. The standoff distance of 80 m was set from the edge of the public area to the main road (see Figure 4). The traffic was set to be in front of the public area only. The hotel had 284 units: 84 king units, 100 double-double units, 44 king/executive units, 12 double-double executive units, four handicapped units, 12 one-bedroom suites and 28 two-bedroom residential suites. The layouts of the units are shown in the Figures 5, 6 and 7. Total estimated functional area is 22,740 m2. 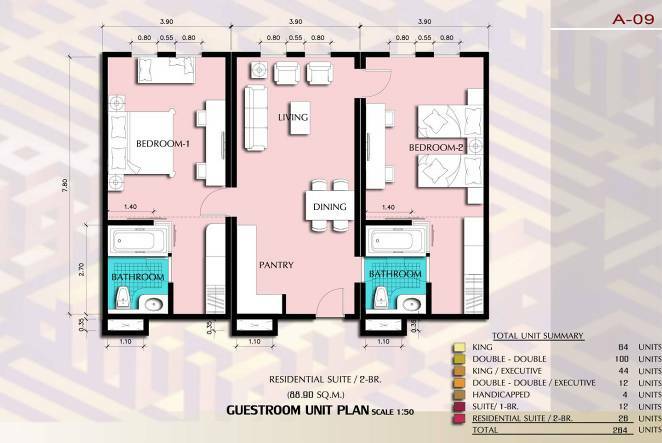 The king, double-double, king/executive, double-double/executive and handicapped units had the functional area of 28.10 m2 per unit. 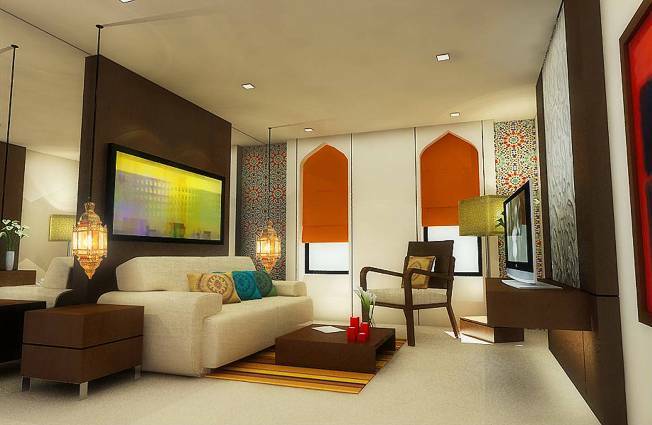 The functional areas of one-bedroom suites and two-bedroom suites were 58.50 m2 and 88.90 m2 per unit respectively. 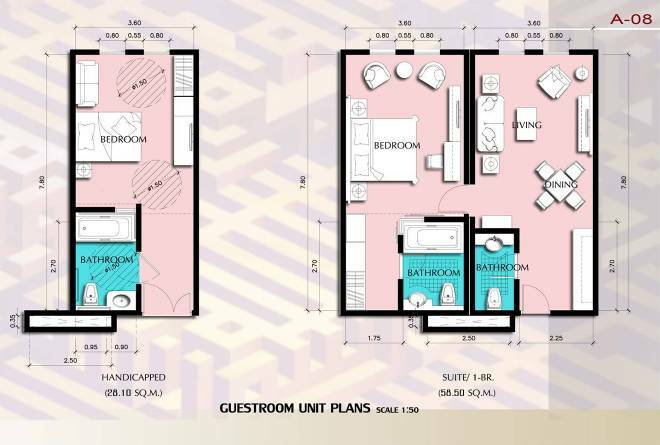 Due to weight and size constraints during manufacturing process and transportation, the one-bedroom suites would be constructed with two standard modules and the two-bedroom suites with three modules. The guestroom building had four stories. 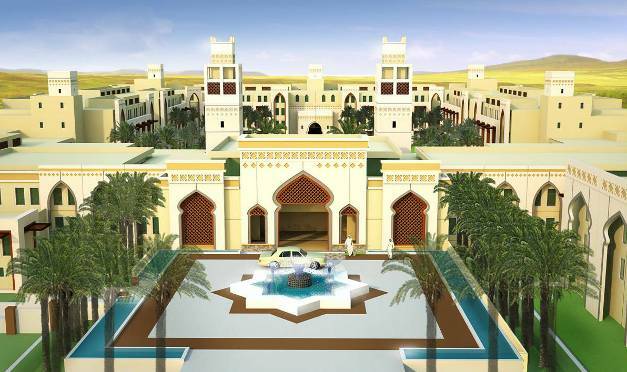 This U-shaped building contained the center courtyard with a large swimming pool as to provide greenery, relieving the harsh desert climate outside the hotel. The public area at the front was a three-storey building connecting to the guestroom building via short covered walkways. The public area building contained lobby, restaurants, convention hall, maintenance and other hotel amenities. These facilities required high ceiling and wide space so the building would be constructed with precast concrete bearing wall system and post-lintel system instead of modular structures as in the guest room building. The modules were to be fully furnished prior to transportation to reduce the construction time as much as possible. The MEP systems were installed in the modules so the modules would only need to be connected once they were transported to the site. 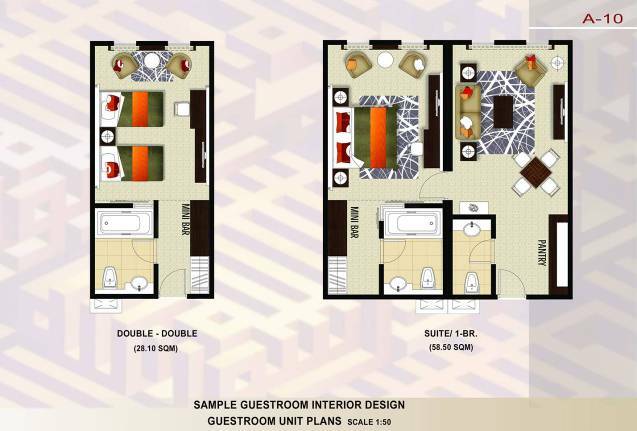 Figures 9 and 10 show the rendering of a fully-furnished double-double room and a one-bedroom suite. Spread foundation, which also served as ground floor slab, was used. Soil strengthening may be employed depending on the actual site condition. Foundations underneath columns and load-bearing walls would be thicker. The foundation was cast-in-place concrete. Floor and roof systems of the service area consisted of double tees, hollow core slabs and solid flat slabs depending on span lengths. 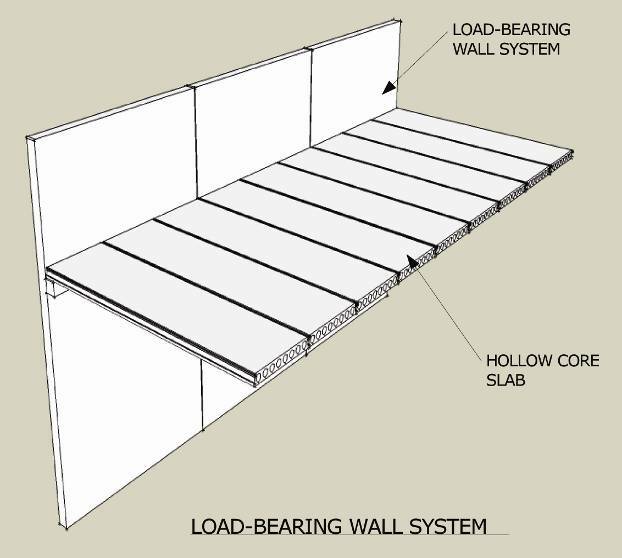 All members were precast concrete having one-way slab behavior (see Figure 11). 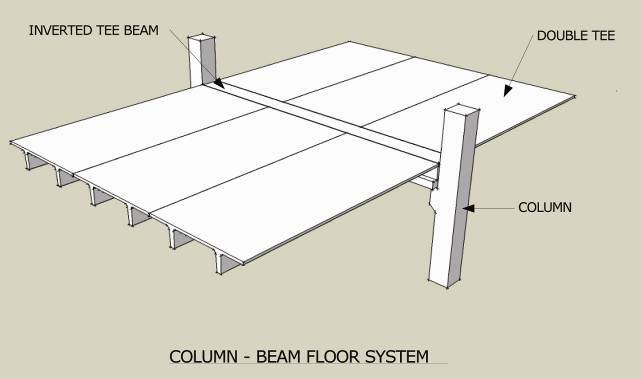 Floor system of the service area was supported by either inverted tee beams, which were in turn supported by columns (Figures 12 and 13), or by load-bearing walls (Figure 14). All members were precast concrete. Guestroom modules were precast concrete boxes that would be stacked up. The bottom slab of the module was a waffle slab to reduce the weight while providing higher capacity than ordinary flat slab. All sidewalls were load-bearing walls. Insulated wall panels were used for exterior walls. Top slab was edge-supported solid slab. The module was 3.90 m wide, 8.10 m long and 2.80 m high on the outside with 15 cm thick walls and slabs. 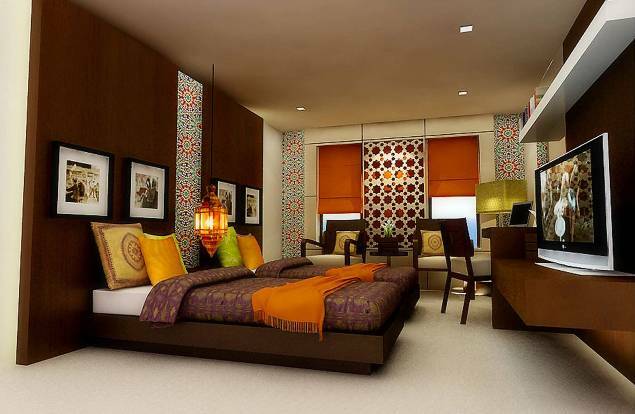 Openings were to be made to the walls of adjoining rooms of the suites. 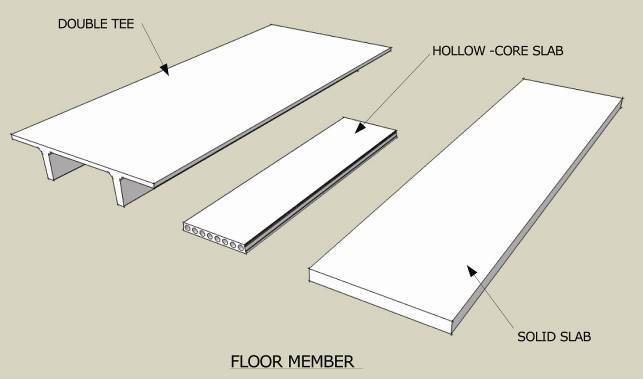 Flat slabs were used to serve as corridors spanning between two sides of the guest room modules (Figure 15). The guestroom modules were kept at the mentioned dimension as to facilitate erection and transportation. The similar modules were currently manufactured for jail cells by the precaster. Due to their limited wall thickness, the reinforcement was mainly steel meshes with reinforcing steel bars around the openings. Stair and elevator towers consisted of rectangular boxes stacking up. 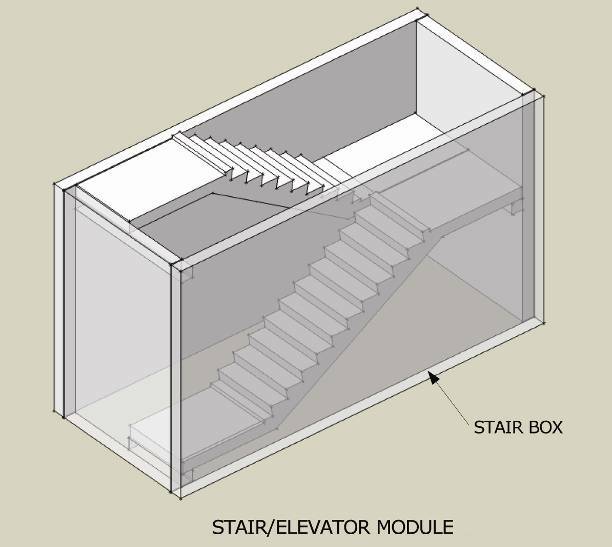 For the stair towers, each box contained stair flights inside for ease of construction (Figure 16). The structures were to resist both gravity and lateral loads. In this project, the stacks were five-module high. This would require close inspection on lateral stability due to wind and seismic loads. 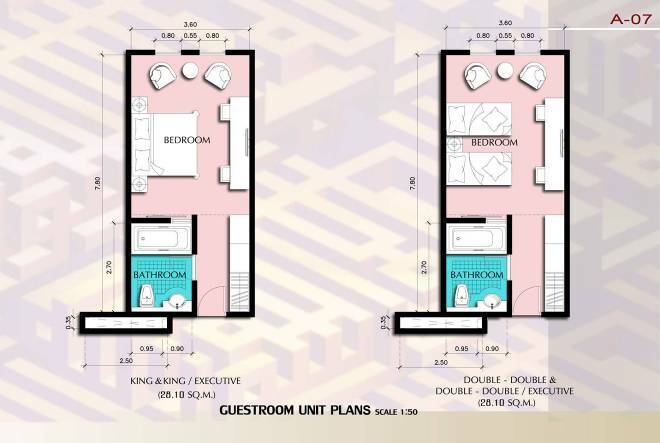 The guestroom modules were arranged with their longer dimension perpendicular to the center corridors. This improved the moment capacity of their connections greatly. The self-weight from five-storey modules also gained greater moment arm to resist the lateral loads. For the public area building, the lateral loads would be resisted by the column-beam frames and the exterior walls acting as shear walls. Exposed wall panels should be designed to withstand blast from possible nearby explosion. Site preparation. MEP trenches were excavated. MEP trench precast concrete modules were placed. MEP outlets were prepared for the module connections. Pouring of the cast-in-place ground floor slab. This slab also functioned as the mat foundation of the project. Column and stair tower foundations were poured separately due to their higher load intensity than other areas. All embedded hardware was installed at the desired locations during this stage. Precast concrete columns and load-bearing walls were erected with temporary bracing. The bracing would be removed after all pieces were in place. The columns were connected to the foundation with base plates and mechanical couplers. The wall panels were connected with steel plates. Both types of connections were grouted to transfer compression and to protect the connections from the element. 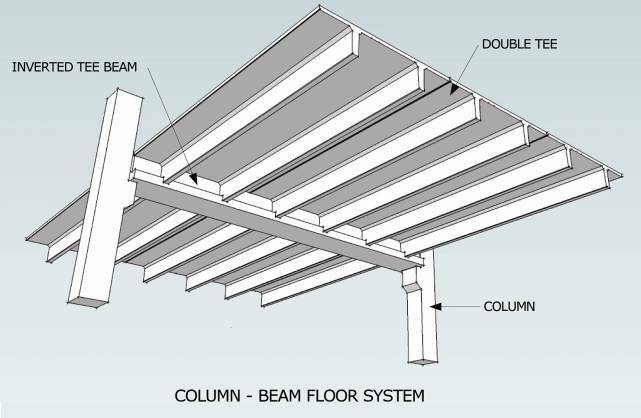 The inverted tee beams were installed on the columns. Concrete corbels were cast integrally with the columns to support the inverted tee beams. Top connections were supplied to prevent the inverted tee beams from rotation due to unbalanced load from double tees. Floor members such as double tees, flat slabs and hollow cores were erected. They were supported by the continuous ledges on the inverted tee beams or the load-bearing walls. Concrete topping and finishing are then placed. See Figure 17 for the erection sequence of the public area. The guestroom modules of the ground floor were installed on the ground floor slab. The modules were connected to the ground floor by dowels and grout. The corridor slabs were erected between the guestroom modules. The slabs would be supported on their longer sides on the notches of the guestroom modules. 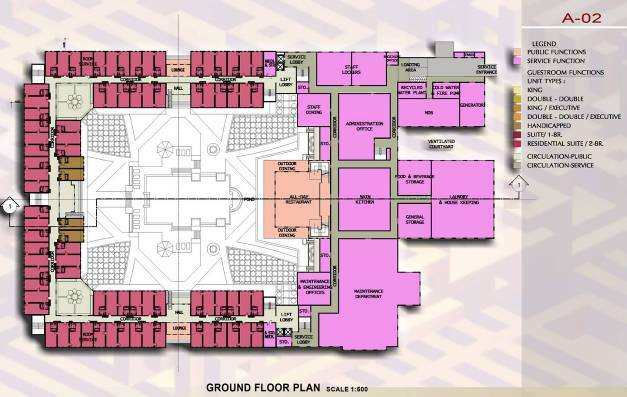 Figure 18 shows the ground floor plan. Once the construction of the ground floor was complete, the upper level guestroom modules were erected over the ground floor modules. They were connected together by dowels and grout. The upper modules would also fix the corridor slabs in place. Steps 7 and 8 were repeated up to the desired level (Figure 19). The stair towers and elevators towers were constructed along with the guestroom modules. They would also be the module construction to reduce the construction time. Top roof slabs were installed between the top-level guestroom modules. Roof parapets and other architectural panels were erected. They are not critical for the strength of the building so decorative finishes and textures could be employed extensively. Roof insulation and toppings were placed. The precaster, Dura-Stress Inc. who is located in the USA, would supply all the precast concrete products to the port of Jacksonville, Florida, USA. Shipping was to be done by other parties to Baghdad, Iraq via a port in Jordan. Erection at the site was assigned to be from Dura-Stress Inc. Wisit Engineering Consultants Limited were working with a Thai architect firm, KTGY Inter-Associates, to provide the design and shop drawings for the precaster. All site works were to be done by local contractors and suppliers. The project was aborted when it was still in the conceptual design stage. However, from the study, it was feasible to conduct the construction process in this way. The module construction was quite useful for the remote site or dangerous site since it would require less personnel on site than other design methods. In addition, it could ensure good workmanship regardless of the project location. 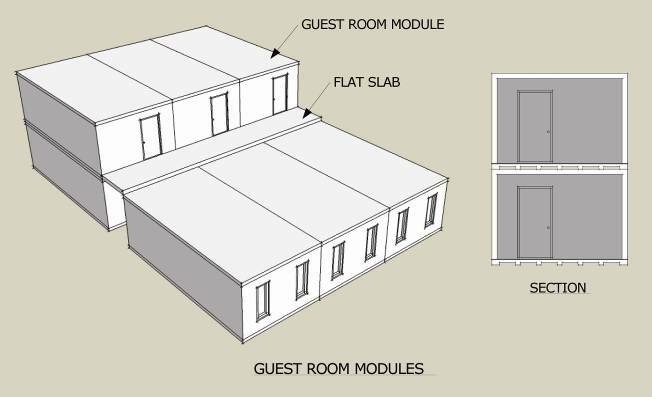 Module construction also provided double walls, which had additional benefit for privacy fitting for hotel buildings and luxurious residential buildings. With close collaboration between engineers and architects, the precast concrete structures can also be aesthetically pleasing as well as practical, as can be seen in this conceptual design.